I love to make stuffed peppers. It’s an easy and great tasting dish to make when you have extra veggies lying around and don’t know what to do with them! Peppers are rich in vitamins A, C and K, to name a few, especially the red ones. Peppers have powerful antioxidants that prevent cancer, disease and support a healthy immune system. I like to stuff an assortment of peppers from green to yellow, but reds are definitely my favorite! My old standby recipe is made with ground turkey, vegetables, brown rice and canned Amy’s Tomato Bisque soup (so good). I can easily change that recipe around to be even healthier, still great tasting and hopefully please the whole family! My husband went to the supermarket for me (boy, do I love when he does that) and brought home some assorted peppers that he found on sale. I made these with the vegetables I had, but you can make it with whatever you have or like. You can also add tofu or seitan, or maybe some slivered raw almonds would taste great. That’s the best part about making stuffed peppers; anything you throw in will usually work and it’s hard to ruin this meal! 1 ½-2 cups tomato soup (no or low-sodium store bought or homemade) I used my Vegan Cream of Roasted Tomato Soup and it was the perfect substitute for the Amy’s brand! Preheat oven to 400 degrees. Cook rice according to package instructions. While rice is cooking, slice the tops of peppers and remove all ribs and seeds. 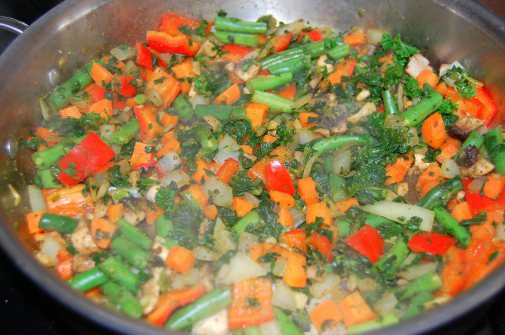 Add vegetables to a saucepan with 2 tablespoons of water. Add VegiZest, Braggs , pepper and fresh parsley. Stir and water sauté vegetable for about 10 minutes, just enough to soak up seasonings. Transfer vegetables to a mixing bowl and stir in brown rice and 1 cup of tomato sauce (add more tomato sauce if it seems too dry). Ladle ½ cup of tomato sauce into a baking dish. Arrange peppers in baking dish. Spoon the vegetable mixture into peppers. Spoon the vegetable mixture into the peppers. Cover with dish with foil and bake for 45 minutes. Remove foil and broil peppers for 5 minutes (I love a crunchy top). Remove from oven, transfer stuffed peppers a to serving platter. 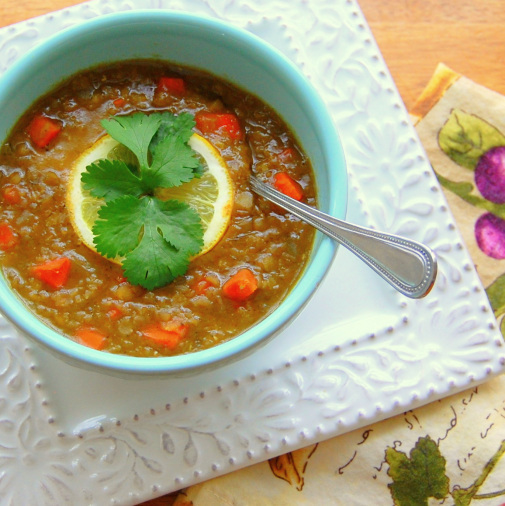 I’ve always loved lentil soup; it’s creamy, filling and absolutely delish in my opinion! Lentils are a good source of protein, iron, dietary fiber, vitamin B1, folate and essential minerals (“Lentil: An Ancient Crop for Modern Times.” Wikipedia: The Free Encyclopedia). Soups are a big part of the Eat to Live diet created by Dr. Joel Fuhrman and I base the way I cook my food on his style of eating. I have been enjoying cooking my food with the limited use of salts and extra added fats. I have learned to season my food naturally. You will be surprised how unappetizing food that is heavily salted and drench in butter/oil begins to taste. Just forgot about what you have learned about cooking and at least attempt this style of eating. You will be amazed at how wonderful you will feel. So why not start reaping all the health benefits a nutrient-rich, plant-based diet can give you and your family?!?! Go for it! This recipe is inspired by the Eat to Live style of cooking. 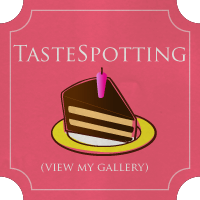 Pretty much all the recipes you will find here are. I use two products to come up with a great tasting way to make a soup base and then I throw in the ingredients I want to cook, season it and garnish it with fresh herbs. The fresh herbs always make a big difference in taste to me. I always keep fresh herbs in the fridge and use them all week in everything I cook. Oh, and I love fresh lemon squeezed on this soup right before serving. The lemon really compliments the coriander. I’m also really into cilantro lately and it tastes great in this soup too. The whole family enjoyed this one. YUMMY! In a medium saucepan, add 6 cups of water, stir in VegiZest and Swiss Bouillon or add vegetable stock if using that instead. Add chopped onion, garlic, coriander, paprika and fresh ground pepper. Bring to a boil, stirring occasionally to break up any chunky seasonings. Boil gently uncovered for five minutes. Add red lentils, reduce to simmer and cook uncovered for 15 minutes. Add chopped carrot, cover and cook for an additional 15 minutes until lentils are thoroughly cooked and soup is thickened. Stir often to prevent sticking to the bottom of your pan. Garnish with fresh chopped cilantro and fresh lemon. S S Yadav et al. Lentil: An Ancient Crop for Modern Times. (2007) In Wikipedia: The Free Encyclopedia. Wikimedia Foundation Inc. Encyclopedia on-line. Available from http://en.wikipedia.org/wiki/Lentil. Internet. Retrieved 16 January 2011. Spinach is a powerhouse of nutrients like iron, beta-carotene and vitamin C. It’s another nutrient-rich food that fights heart disease and cancer. I can’t get enough of it, raw or cooked. Our mom always told us how good it was for us and she was not wrong. So, eat your spinach folks! I made this salad for company this past Saturday night and it was a hit! The dressing is my new favorite and I will be using it not only on this salad, but on others as well. 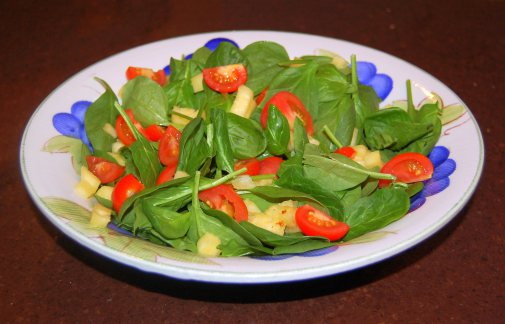 Put the spinach, tomatos and pineapple in a large bowl. Drizzle with some of the dressing, toss and serve. Place all ingredients in a blender, Cuisinart or mini prep (I love my mini prep for dressings), blend until smooth. Use as needed. We do a lot of our cooking around here on Sunday, so during the week there is less time cooking and more time to enjoy with our family. I love to roast a head of garlic on Sunday to use in a variety of recipes during the week. My all time favorite was spreading warm roasted garlic on a baguette slathered with warm, melty brie. Sorry if I made your mouth water, but now I will just be saving that for my once a year treat! Sitting here writing that though, I can honestly say I haven’t even been missing my old cravings since beginning this new journey. 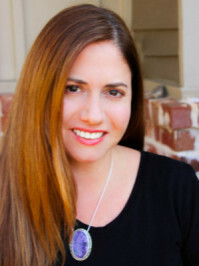 I’ve been having to much fun coming up with the most nutritious versions of my favorite recipes to even think about it. My energy level has been through the roof and I’ve lost 7 lbs in 2 1/2 weeks! See you later baby weight and you can temp me all you want delicious brie, I’m over you! HA! =) Anyhow, back to roasted garlic. I love the flavor of roasted garlic better than sauteed garlic most of the times. It’s got such a creamy, sweet taste and it’s not so garlicky that you will be tasting it for the rest of the day! Not only does it taste good, but is good for you too. Garlic is nutrient-rich and supports a healthy immune system that has been shown to fight off colds, cancer, heart disease and infection. It’s so easy to do and so worth making it…Mmmmmmmmmmmmmm! 2. Using a knife, cut off a 1/4 inch of the tops, exposing the cloves of garlic. 3. Wrap garlic glove in tin foil twisting the top to seal in the garlic. 4. Roast directly on rack or on a tray for 40 minutes to 1 hour or until cloves feel soft to the touch. 5. Remove garlic from oven and allow to cool slightly. I find the easiest way to get the roasted garlic out is just by squeezing a clove with my fingers or you can use a small knife and fork to get it out. Cover dates with cold water and soak for 1 hour. Remove dates and reserve water. Place dates in blender or Cuisinart and process until smooth (I like to use my Cuisinart Mini Prep for this). Adjust consistency with some of reserved water, if needed. Store date paste in an airtight container in your refrigerator for up to two weeks. Use as needed. Tomatoes are full of all kinds of health benefits. They contain lycopene which is a vital antioxidant that helps fight against cancer and they are loaded with vitamin A and C. Tomatoes are highly versatile and can be used in so many recipes. One of my favorites is cream of tomato soup. I absolutely looooooooooooooove cream of tomato soup! Let’s face it though, it is not healthy or low fat after all the cream is added to the soup, but boy is it delicious! So, with a lot of thought and years of eating this stuff, I was able to come up with my own super nutrient-rich version. 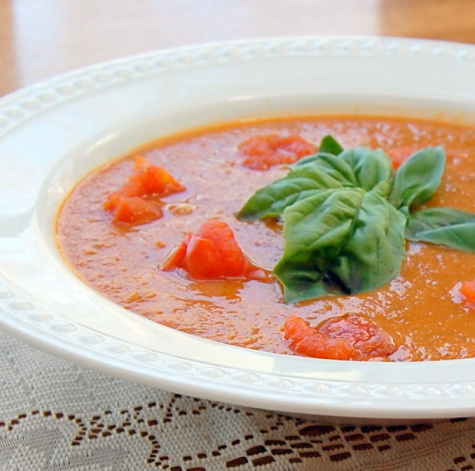 My sister-in-law, who is also a wonderful chef, always roasts her tomatoes in the oven like this for sauces, so she definitely inspired this soup. Try it and let me know what you think! 3 tablespoons Dr. Fuhrman’s VegiZest or other no-salt seasoning. Slice the tomatoes into halves. Stuff the tomatoes with the garlic. Line two trays with parchment paper or use non-stick trays. Spread the tomatoes and onions onto the baking trays. Roast for 30 minutes. Remove roasted tomatoes and onions from the oven and transfer to a large stock pot. Reserve a couple tomatoes for garnish. Add the vegetable stock and bay leaves. Bring to a boil, reduce heat and simmer for 15-20 minutes or until liquid has reduced by a third. Remove bay leaves. Add the soup to a high powered blender or cuisinart with cashew nuts to puree the soup until smooth. Return soup to low heat and season to taste with freshly ground black pepper. Garnish in bowl with some chopped roasted tomatoes and fresh chopped basil. This soup is a great base and it freezes well too. I use it for stuffed peppers and I often throw fresh spinach, kale and/or other vegetables into it for a heartier version.